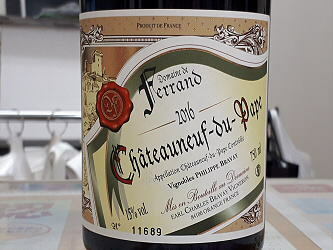 The full-bodied 2016 Chateauneuf du Pape is a terrific effort from Domaine de Ferrand. Nearly 90% Grenache, with the balance a blend of other permitted varieties, it's concentrated and rich, with hints of allspice, anise and pepper adding nuance to the layers of ripe cherry and apricot fruit. Complex and velvety, this has it all. The only 2013 presented (I reviewed his two Cotes du Rhone from barrel last year) and a pretty, perfumed wine from Bravey, the 2013 Chateauneuf du Pape (93% Grenache, 2% Syrah, 2% Mourvedre, 2% Bourboulenc and 1% Cinsault) offers lots of wild strawberry and darker berry fruits, lavender, underbrush and mint on the nose. Medium-bodied, seamless and elegant with a layered, silky style that makes it already hard to resist, it will still be better with short term cellaring and drink well through 2025.